UniversitätsKlinikum Heidelberg: Have you been advised to give up cabbage? Have you been advised to give up cabbage? 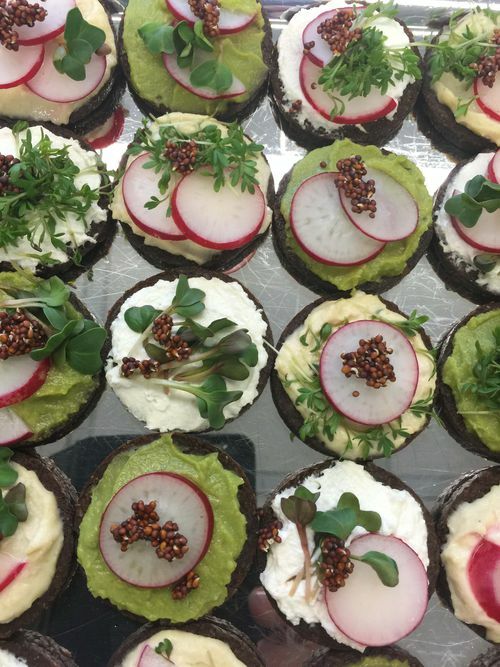 Pumpernickel bread topped with avocado cream, humus and horseradish cream cheese, garnished with broccoli sprouts, radishes, cress and radish sprouts. - Broccoli and cauliflower are easily digested, if just eat the florets, but not the stem. - Pointed cabbage doesn’t cause flatulence. - Cook all types of cabbage long to make them more digestible – simultaneously eat to boiled cabbage fresh cruciferous (radish, watercress, arugula, mustard, rapeseed oil), so that the inactive precursors are activated. - Prepare cabbage with caraway or fennel, which relaxes the intestinal muscle and makes flatulence more tolerable. - Smaller portions throughout the day are easier to digest.